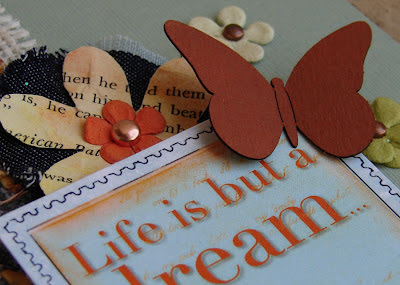 Blog Quick Quotes: Barb - Tin Type! Hello! 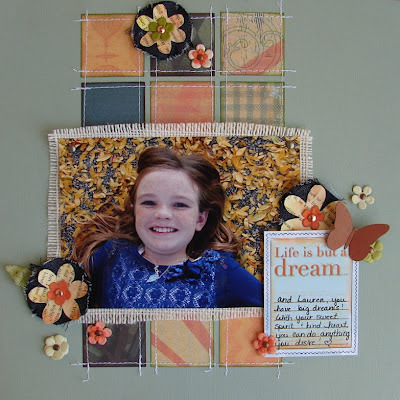 I'm Barb and I am thrilled to be sharing my first project with you as a Quick Quotes Designer! Quick Quotes has so many gorgeous lines of paper out right now and I couldn't wait to get started with designing with them. First up... Tin Type! This line is gorgeous! The colors and designs are fabulous! Now, when I first saw this line, I thought 'boy'. Everything about it seemed masculine to me. Well, one thing you should know about me is that I like to do the unexpected! So, I challenged myself to make a "girly" layout using this line! And I have to say, I love the results! I used a square punch to cut a few squares out of each of the Tin Type papers. Because these are double sided papers, I ended up with twice as many designs! Love that! I inked the squares using Mocha Mama and Green with Envy PowderPuff Chalking Inks. After adhering them to the cardstock background, I used my sewing machine to stich borders on the squares. I matted my photo with a piece of burlap using brads to hold the photo and burlap together. The butterfly is from the Butterflies Bag O' Chips. I love, love, love these chipboard embellishments! They are light weight and with the butterfly, I could bend the wings up to make it appear as though it is ready to fly right off my layout! I colored this butterfly quickly by using the Mai Tai PowderPuff Chalking Ink. I also used the coordinating phrase from the Tin Type Line. I loved the journaling prompt it gave me. I have a daughter who as major dreams (seriously, if you listened to her, you would never know she is only 9!) and this was perfect for her layout! Here you can see all the different patterns used! Gorgeous! I also wanted to tell you about the flowers I made. I took a page out of a very old book and inked it up with the Lemonade and Mai Tai Powderpuff Chalking Inks. I then spritzed the page with water and wrinkled it all up. (Warning... the paper will be fragile and tear easily so scrunch with care!) I straightened the paper out and let it dry. Once it was dry, I cut out the flower shape, added a smaller flower on top, denim behind and secured it all together with a brad. Thanks for stopping by and visiting here at Quick Quotes today! I LOVE this Barb!!! beautiful! Like the layout & especially like the use of the burlap for matting. Barb, this is absolutely beautiful. I love the burlap matte and the layout itself is great. Thanks for sharing. Very nice layout. I like how you embellished without overwhelming the picture. Adorable!! 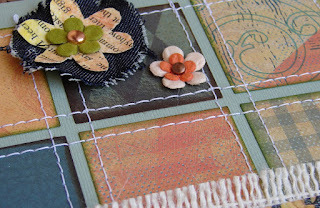 I jost love the stitched squares!